Fine arts is an important part of life at BJU. From music to art to theatre, there’s almost always some kind of event to enjoy. And if you want to get involved, whether you are studying fine arts or not, there are tons of ways to develop your skills. Almost every week there is a music concert or recital you can enjoy. There are concerts by orchestras, bands, choirs, small ensembles, as well as recitals by students or faculty. 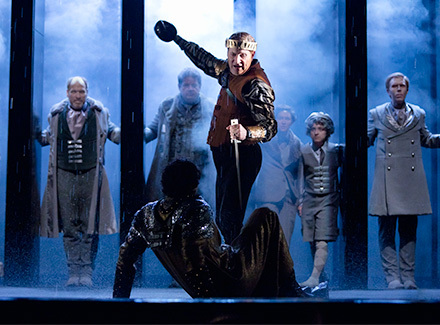 There are often large performances such as Handel’s Messiah or a full-scale opera such as Tosca, The Barber of Seville, Samson et Dalila, Rigoletto or Aida where the cast and crew include faculty, staff and students, and guest artists in the lead roles. Nearly every music event is free for you as a student. There are multiple choral and instrumental groups you have the opportunity to join. Participating in musical groups is typically audition-based and is open to all students. Some of the smaller groups don’t require auditions. 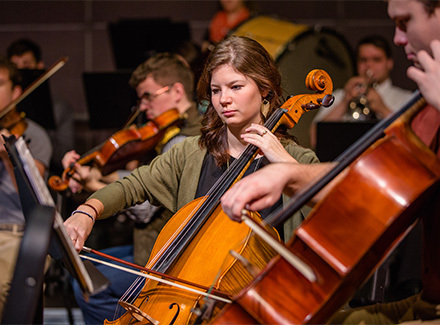 The 70-piece BJU Symphony Orchestra, the core ensemble of a three-tiered orchestral program, has a long and rich tradition of presenting masterworks from the orchestral repertoire in addition to mounting award-winning productions in collaboration with the BJU Opera Association. Auditions are open to all students in the University regardless of major program of study. Each member has the opportunity to use music for the service of God and to reach individual technical and artistic potential within a program that pursues the highest level of musical excellence. A typical yearly schedule consists of a fall masterworks concert in October, a family-oriented/educational concert in November, a weeklong out-of-state tour (biannually), an opera performance in March, and a spring gala concert featuring the winner of the annual aria/concerto competition. Under the baton of Dr. Michael W. Moore, recent BJUSO performances have featured John Adams’ Short Ride in a Fast Machine, Ludwig van Beethoven’s Symphony No. 1, Felix Mendelssohn’s Symphony No. 4 (“Italian”), Peter Tchaikovsky’s Piano Concerto No. 1, and Richard Wagner’s Ride of the Valkyries. The Symphonic Wind Band is a large ensemble dedicated to providing its members a band experience of the highest quality. Auditions are open to all students, but music majors and graduate students constitute the majority of its membership. Dr. Dan Turner has directed the band since 1981. The Concert Band is a 45-piece ensemble dedicated to providing its members a band experience of the highest quality. Auditions are open to all students. Dr. Bruce Cox has directed the band since 1997. The Bob Jones University Chorale, under the direction of Dr. Warren Cook, is comprised of both undergraduate and graduate students. Any advanced vocalist regardless of program is eligible to audition. The Chorale performs regularly on campus in full-length concerts as well as oratorio and opera productions. The Chorale also tours regularly, performing community concerts, conducting school music festivals, and singing for churches and Christian schools. Every year university-wide auditions are held for those who are interested in performing in productions. The scale of these productions ranges from the official Concert, Opera & Drama Series events to productions directed by theatre arts students. Whether you are interested in performing in Shakespearean plays such as Hamlet, Macbeth or Othello, or student plays such as The Mousetrap, Our Town and It’s a Wonderful Life, you’ll have the opportunity to audition for a part. You can enjoy these productions in Rodeheaver Auditorium or Stratton Hall, our traditional stages, or in the cozier atmosphere of Performance Hall. Art connoisseurs and amateurs alike enjoy the many art exhibits throughout the year. 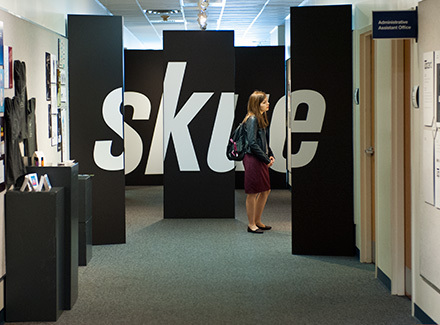 Art and design students have opportunities to display their work, and they often sell their works of art to people who come to see their exhibits.